It's Sunday, and you've probably got a spare hour at your hand. 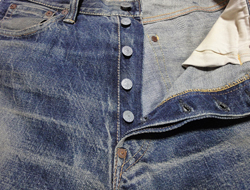 Take a look at an amazing denim collection, with lots of worn in samples. The website is rather poorly made, which only adds to the charm. Takashi covers lots of well know brands, like Evisu, Denime and Sugar Cane, but also has a few gems that you don't read about very often, like American Dream and Dania. It helps if you can read Japanese. If you don't, Google Translate is your friend.